May 20th 2013 – An F5 tornado killed 24 people of which 10 were children. Nearly 400 people were injured and, last I heard, 12-14 thousand homes were destroyed. A large majority of the homes didn’t have even one wall left standing. The tornado was nearly 1.5 miles across at its widest and was on the ground for almost an hour for 17 miles. Can you even imagine that? I live nearby and it doesn’t even compute for me even though I saw the aftermath first hand. If you have lived in Oklahoma for a number of years you have probably witnessed Oklahoma coming together as a community on several occasions. If there is one thing we do well it is organizing disaster relief; both natural and man-made. According to FEMA we have endured 74 Presidential disasters in the past 60 years. This post is dedicated to all my fellow Oklahomans…my neighbors…my friends. All of us have a story to tell. We all knew storms would come and at what time they would start. We knew they had the potential to be bad because it was …sticky, hot, and humid. Live here long enough you don’t need a weatherman to tell you that terrible storms are on the horizon. Most of the time, people just watch the radar and go about their normal lives. Tornadoes rarely occur before noon so we really only need to worry from the hours of 2pm to 1am, it seems. On this particular day it got really dark outside with that strange yellow tint in the air. Thunder was rolling constant and stepping outside felt like stepping into a sauna. I work in an industrial area right off a main highway in a metal building which wouldn’t stand any kind of chance in a weak tornado, much less a bad one. I had often found myself, before this day, thinking if I only had minutes to take cover I would try to make it to McDonalds or Braums to hide in their walk-in refrigerators. The radar showed the storms had the potential to carry the core right over our area so as the tornado sirens went off we shut down the office and headed home or away from the core of the storm. Just a few blocks to the west, I entered the turnpike under blue skies. The radio was tracking a potentially dangerous core to the south east of where I had just left. The weathermen and storm chasers can tend to sound overly dramatic sometimes to someone who isn’t used to hearing them but you could tell, this time, they were worried. They kept using phrases like, “a tornado is imminent”, “it is a very dangerous storm”, “this storm has power”, and moments later there was a tornado on the ground. The weatherman was adamant, he kept saying there is no time left to do anything but take shelter, take shelter now, and you are out of time. The storm was moving towards Moore and even though it lasted almost an hour, it felt as if it came out of the sky and destroyed approximately 14,000 homes in a matter of a few seconds. When I got home sirens were still going off but all the action was to the SW of us by a few miles. I saw kids running home off the busses worried they were going to be caught home alone. I told each child it was several miles away and the sirens weren’t for us and made sure they made it to their front doors safely. My daughter got home 20 minutes early; I am thankful I was home early because she was terrified. I turned on the news and they were telling everyone who had families in Moore they were working hard to see what happened. People who had children and spouses in Moore were pacing in front of the TV sets and trying to call their loved ones. The next couple of days, the whole community sat praying, agonizing, and crying for people that didn’t make it and for those who lost their homes. Hearing that children had perished in one of the schools was torture and the stories of bravery and survival were endless. The news was reporting high death tolls making anxiety even worse. Later this misinformation was cleared up and the death toll was much lower but death is death and every death caused unbearable heartache in the community. We listened as reports of debris rained down in neighboring states, as far away as Branson Missouri. I won’t repeat the personal stories I heard because, much like the stories I heard after the Federal Courthouse was bombed, they will haunt me until I die. I remember one of my relatives losing her house in the May 3rd tornado 14 years earlier and asked her why she rebuilt in the same spot. She said, “What is the likely hood we will get another tornado?” Well, it made sense. Her house survived this time but the tornado literally overlapped at one point with that of the May 3rd tornado. My friend Yousef asked if I would like to volunteer with him. We then decided to get a small group together to volunteer in the relief efforts. Pictures barely begin to portray the chaos endured. We each partnered off and helped in different areas. I have never volunteered before so I didn’t really have any idea of what to expect. I think I expected chaos. Not just in the disaster but in the organization. Traffic madness, long lines, etc but I was surprised. There were several churches acting as project headquarters. Hotlines and websites were set up for volunteers to sign waivers and get assignments via email complete with locations and times to meet. We decided to meet up with my church who partnered with a local Moore church. Residents had requested help in certain areas and team leaders were organized for each area. People showed up and volunteered for the area they wanted to work with doing the work they could physically do. Donations of work gloves, safety glasses, buckets, rakes, dust masks, cooling clothes were all made for the volunteers to wear and use. My friend Molly and I volunteered to help homeowners who lost their homes in a very hard hit area. The area was told to have had several elderly residents. Our task was to find a homeowner that was on the premises and offer to help them retrieve belongings they couldn’t replace…photographs, safes, money, firearms, etc. We went in with open hearts, open minds, and as much physical strength as we could muster. I loaded my car up with 4 other strangers and we snaked our vehicles down streets to get to the location affected. At first the homes were fine, and then limbs littered a few yards and then a few windows where boarded up. Half a block later, roofs were missing and only partial homes were left standing. I felt like I was on my way to a movie set or something. There were bulldozers, dump trucks, bobcats, and electrical trucks everywhere. It wasn’t registering as real. We parked in front of homes that appeared fine and walked two blocks north onto a street where the south side had damaged homes and the right side of the street was swept away. We walked to the end of the street and the first totally obliterated house had a man searching for his stuff. We stopped and he told us what he was looking for. This man had been riding out the storm in his hallway…the hallway that was under several feet of debris. This house had been reduced to a five foot pile of sheetrock, insulation, wiring, glass, tile, clothes, wood and pieces of broken furniture. Nearly 30 of us helped him bit by bit clear the rubble searching for old photos, a safe, and his firearms. He didn’t care about much else. 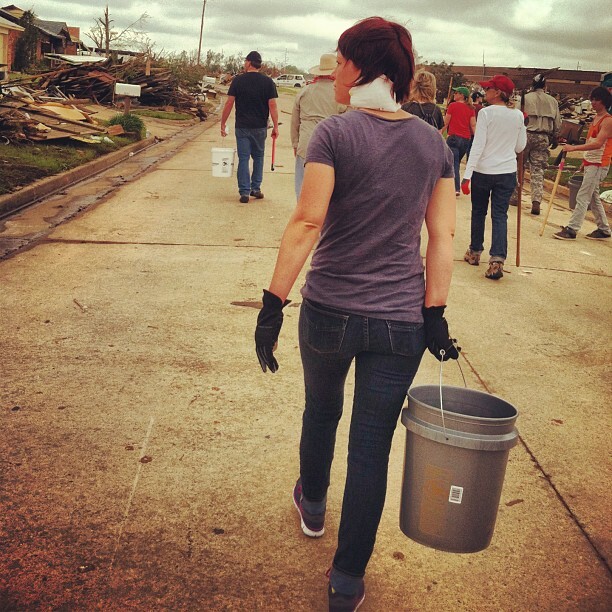 I learned a few things about clean up after a tornado. Here is my list of the top 5 things to watch out for when clearing debris. I had a few close calls with all of the things above, except the firearm we found was in a case and not loaded. I thought about all the things we found and salvaged lining this man’s driveway. What is he going to do with it? He has no place for it to go? He has no way to get it from here to anywhere. I wondered if U-haul or storage facilities where going to help them out. I wondered what was going to happen with all their monthly recurring bills, those charges they couldn’t take service for? We did what we could the 5 hours we were there and we all felt so accomplished…well we did until we stood up and looked to the east at the other 14000 homes. It was hard not to feel defeated and overwhelmed. The volunteers looked like ants in a landfill….there were hundreds of people helping in just this one area. Kids and their parents rolled wagons down streets offering hot dogs. People came by offering water, soup, snacks, etc. Others brought out tools and chainsaws. It was truly beautiful and everyone, even the homeowners, offered smiles to passing strangers. I only took a few pictures which I will include in this post. Moore may have been reduced to rubble, but the community will be rebuilt. Judging by the community effort I saw, and continue to see, Moore will represent what a bunch of resilient hearts can accomplish. I must say Hastywords, I know that I’m not strong enough to witness something to that degree! And above all you still communicate with me…. If you need the time, please take, I can wait your love of people is far greater than mind! I don’t believe in a god, however bless your soul…. I agree with papabearshw – if i had the time and resources, i wish i could hop a train/bus/plane down and help. You are a good person to the core. I went on search parties looking for a missing girl… all over the San Diego desert… I still can’t even talk about it… good post. Some memories are just cemented into our minds. Maybe I should do a post about that… might be good for me. Oh My. Really makes you think more. You see the news, but only what they want you to see. I cannot begin to imagine what everyone has gone through.